I’ve mentioned before how my grandma used to bake walnut oatmeal raisin cookies for my grandpa every week. She stored them in the freezer in a plastic container with a lid, each layer separated by a piece of waxed paper, and they tasted every bit as good as when they were fresh baked after a short thaw. As much as I love fresh-baked cookies, I don’t bake them that often because this is usually how the scene goes down… Maybe you can relate? I start measuring out the ingredients. Then one kid wanders into the kitchen and wants to pour in the flour, and then another joins and wants to measure out the baking soda. A third starts whining about how one and two got to add more ingredients than he or she did, and then a fourth wants to stir the mixture, flinging a dusting of flour across the counter in the process. Finally number five walks in on the tail end of everything to sneak a taste of the raw dough, which then prompts the other four to start tasting, and tasting, and tasting some more. End result? We only have about 24 baked cookies which last all of 30 minutes. So today I figured I’d get a head start while the older kids were at school. With only my preschooler to contend with, it was a simple matter of measuring ingredients and picking out the eggshells from the eggs that said preschooler insisted on cracking. I used my grandma’s recipe, but instead of stirring in raisins and walnuts, I mixed in some coarsely chopped dried cherries and chopped toasted almonds. Oh. my. heavens… I think this combination may be even better than the classic walnut oatmeal raisin cookies! While my grandma’s recipe estimates that it makes 7 dozen or so cookies, I apparently make larger than average cookies and ended up with a modest 4 dozen — still a big improvement. However, the funny thing is they really didn’t last any longer than usual. I literally walked out of the kitchen for two minutes and walked back in to find that my husband had already inhaled four of them, while Drew scarfed down three. And okay, so I “sampled” three myself as well. Then the older kids got home from school, and it was all over. Even my youngest daughter who subsists primarily on pepperoni pizza and peanut butter and jelly sandwiches proclaimed that she loved them. Yes, those were her exact words — you could have knocked me over with a feather. I finally had to hide the last five cookies so there would be something left for my older daughter when she got home from gymnastics. So it goes without saying that we’ll be making another batch very soon. 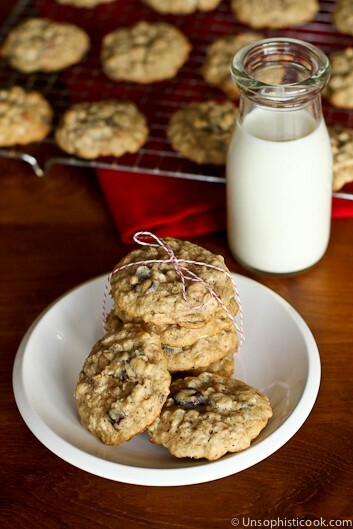 Or even better, we’ll make several batches to share with family and friends this holiday season! Cream together butter, sugar, eggs and vanilla. Stir in water. In a separate bowl, whisk together oats, flour, baking soda, salt, cinnamon, and cloves. Slowly add this dry mixture into the wet mixture, stirring until combined. Stir in toasted almonds and dried cherries. Using a medium cookie scoop, drop two tablespoons of dough per cookie onto a cookie sheet, leaving about 2 inches between cookies. Bake for 10-12 minutes until just starting to brown. Traditionally my grandma makes this recipe with 1/2 cup walnuts and 1 cup raisins, but I like to experiment! I think dried cranberries and macadamia nuts are next on the agenda. glad you could make these cookies with a little bit of peace :) they look awesome!